(2) BEWARE FAUX SPOILERS. Will R., who says Hobotopia is a long-running web comic, and one of the nicest things in all of the Internet, draws attention to its ostentatious Spoiler Alert for what turns out to be a pretty obscure The Force Awakens spoiler. (3) ACTION FIGURES. Here are your prototype action figures for the Ghostbusters reboot. There wasn’t much chance Mattel would repeat the mistake Hasbro made with The Force Awakens of leaving out the female characters, was there? Amanda Kooser at CNET already has play suggestions. The action figures come from toy company Mattel and will be 6 inches (about 15 centimeters) in height. That’s a pretty standard size for action figures, so you should be able to fold them into imaginative play along with your Star Wars and Star Trek collection. The crossover possibilities are endless. I can’t wait to see what a proton pack does against Kylo Ren. Click on the link to see the rest. (5) MEAN STREETS. Tobias Carroll at Literary Hub introduces a review by reminding everyone of the time Raymond Chandler mocked science fiction. In a 1953 letter to his agent H.N. Swanson, Chandler indulges in a brilliantly entertaining, paragraph-long parody of sci-fi writing, which hits every trope and cliché of the genre. Oh, and he namedrops Google some 45 years before Larry and Sergey registered the domain. They pay brisk money for this crap? In the case of Adam Christopher, Chandler’s rivalry with science fiction gave rise to literary inspiration. In the acknowledgements to his new novel Made to Kill, Christopher writes that “what I really wished did exist was Raymond Chandler’s long-lost science fiction epic.” He describes himself as “amused” by “the way Chandler hated science fiction.” There are a handful of nods to Chandler’s infamous riff on the genre peppered throughout Christopher’s novel, including as its epigraph. Made to Kill can be read as a science fiction-laced detective story and as a way of using the detective story template to investigate more archetypally science fictional themes of memory and identity. The setting of Made to Kill is an altered 1965: John F. Kennedy is president, the Cold War rages on, and American society has had an unsuccessful dalliance with incorporating robots into everyday life. The last survivor of this program, narrator Ray Electromatic, is the detective at the center of this novel, drawn into a conspiracy involving Hollywood stars, radioactive material, and Soviet spies. Ray makes for an interesting protagonist in a number of ways: as robots go, he has an unexpected moral compass, and the fact that his memory only lasts for a day does a good job of establishing him as a less-than-reliable narrator from the outset. (6) YOU’VE BEEN WARNED. David Gerrold says he’s learned from (bad) experience to avoid feuds, as he explains on Facebook. 4) “Forgive and forget” does not apply here. Everyone in a feud, no matter what side they’re on, has already succumbed to self-righteousness, simply by being in the feud. Self-righteousness is terminal. 6) Sociopaths and attention whores enjoy feuds. People who have not yet learned a modicum of restraint or self-awareness are the biggest victims. 7) Screechweasels and harangutans will outlast everyone and declare the victory of getting the last word. It’s a hollow victory, because most of the other participants will have walked away in disgust. 8) Reconciliation of any kind is almost always impossible — because there is always at least one person who needs to recap the past in one last attempt to prove the other side wrong. (7) CALL FOR PAPERS. “Reframing Science Fiction”, a one-day conference on the art of science fiction, will be held in Canterbury (UK) on March 21. Keynote speakers: Dr. Jeannette Baxter (Anglia Ruskin University) and Dr. Paul March-Russell (University of Kent). From William Blake and John Martin to Glenn Brown and The Otolith Group, artists have been producing works of art that are science fiction. And artists and their works have been incorporated into many works of sf. Meanwhile, on countless book covers and in magazine illustrations, a visual language of science fiction has evolved: bug-eyed monsters; spaceships; robots and so on. Art in the comic strip and the graphic novel has been the means of telling stories in visual form – whilst artists such as Roy Lichtenstein have made comic panels into art. The call for papers (which opened some time ago) has a January 15 deadline. (8) ONE ISLAND’S OPINION. Colleen Gillard’s article “Why the British Tell Better Children’s Stories” in The Atlantic is high-brow click-bait. The small island of Great Britain is an undisputed powerhouse of children’s bestsellers: The Wind in the Willows, Alice in Wonderland, Winnie-the-Pooh, Peter Pan, The Hobbit, James and the Giant Peach, Harry Potter, and The Lion, the Witch, and the Wardrobe. Significantly, all are fantasies. Meanwhile, the United States, also a major player in the field of children’s classics, deals much less in magic. Stories like Little House in the Big Woods, The Call of the Wild, Charlotte’s Web, The Yearling, Little Women, and The Adventures of Tom Sawyer are more notable for their realistic portraits of day-to-day life in the towns and farmlands on the growing frontier. If British children gathered in the glow of the kitchen hearth to hear stories about magic swords and talking bears, American children sat at their mother’s knee listening to tales larded with moral messages about a world where life was hard, obedience emphasized, and Christian morality valued. Each style has its virtues, but the British approach undoubtedly yields the kinds of stories that appeal to the furthest reaches of children’s imagination. And it works – people are coming unglued in the comments. I don’t think this trend is mostly an artistic or marketing choice, even though that’s what people in Hollywood usually say. I think “more explodey” is driven by the need to justify budgets, and by the individual interests of the people who have to do it. (10) UNEMPLOYED KAIJU. They won’t be needing any special effects for Pacific Rim 2 — it’s dead, Jim. According to The Hollywood Reporter, the follow-up to director Guillermo Del Toro’s monsters-versus-robots epic is “off the table indefinitely” – and in its place, del Toro has entered talks with 20th Century Fox to helm a rather different sci-fi spectacular. Del Toro is reportedly gearing up to take the helm on ‘Fantastic Voyage,’ a remake of the 1966 sci-fi classic which starred Raquel Welch and Donald Pleasance as members of a team who are miniaturized in a submarine and injected into the body of a dying scientist in order to save his life. (11) CLASS. The Doctor Who spinoff Class will air on BBC America in 2016. It was already on BBC Three’s schedule in the UK. The eight-part series is from young-adult author Patrick Ness, who is known for writing the “A Monster Calls” books. The series is exec produced by “Doctor Who’s” Steven Moffat and Brian Minchin and is a co-production between BBC America and BBC Cymru Wales. It is filmed in Cardiff in the U.K.
“I’m astounded and thrilled to be entering the Doctor Who universe, which is as vast as time and space itself,” said Ness. “I can’t wait for people to meet the heroes of ‘Class,’ to meet the all-new villains and aliens, to remember that the horrors of the darkest corners of existence are just about on par with having to pass your exams,” he joked. (13) TENTACLE TIME. Matthew Dockrey, designer of Sasquan’s Hugo base, made news with his new piece of public art in Vancouver (WA). 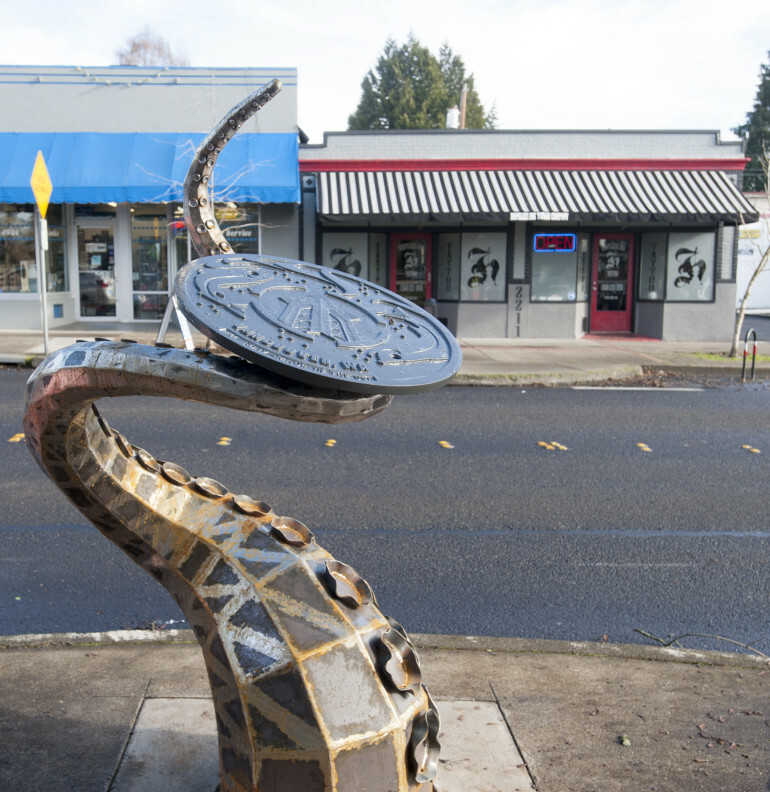 A giant steel tentacle bristling with saucer-sized suckers is slithering from the sewer in Uptown Village at Main and West 23rd streets. Does it belong to an enormous octopus? A sea monster? Is it the tail of a dragon? The imagination reels with possibilities. The sculpture, created by Seattle metal artist Matthew Dockrey, is Vancouver’s newest piece of public art. Called “The Visitor,” the 5-foot-tall appendage cradling a genuine city manhole cover was installed Saturday. It will be dedicated at a celebration at noon Friday by the Uptown Village Association, Arts of Clark County, Vancouver’s Downtown Association and the city. Karen Madsen, chairwoman of the nonprofit Arts of Clark County, said the artwork selection committee had sought a piece that was whimsical and interactive and that would endure over time. The sculpture, which Dockrey specifically created for the site in front of the old Mission Theatre, fits within the Steampunk art movement, she said. (14) THE FRONT. Cedar Sanderson has pulled together the Mad Genius Club’s considerable wisdom about cover creation for self-published books into one post. First and most important: before you start designing a cover, creating art intended for book covers, or even thinking about a book cover, you need to look at book covers. A lot of them. Specific book covers to your genre is even better, as there are subtle cues you need to know and recognize, even if you aren’t doing your own covers. So first, before anything else, go to Amazon and search for your sub-genre (space opera, paranormal romance, werewolf stories, historical military fiction, whatever it is) and look at the top 100 selling books. Not the freebies (unless you are looking at what not to do). Make notes of elements you like, things you hate, and the consistent notes that many of the covers have in common. When you’re done with this, you are ready to begin. (15) HUGO PREP WORK. 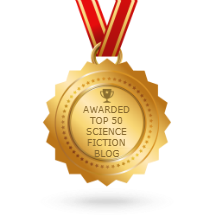 Shaun Duke has posted a crowdsourced list – “The 2016 Hugo Awards Reading/Watching List (or, My Next Few Months)”. 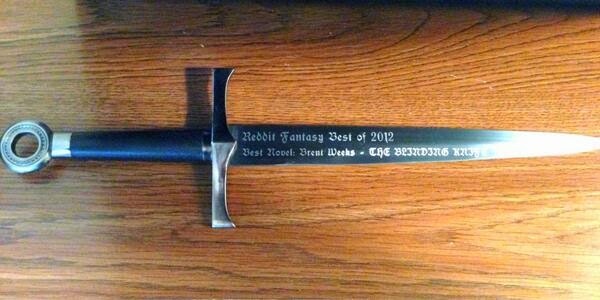 Last month, I asked for recommendations for my annual Hugo Awards reading bonanza. A bunch of you responded with books, movies, TV shows, cookbooks, and so on. The form will remain open for the next month or so, so if you haven’t submitted anything or want to submit some more stuff, go for it! (15) IN THE REAR VIEW MIRROR. Doris V. Sutherland resumes her analysis of the comparative quality of Puppy and non-Puppy Hugo nominees in the past two races in “2014 Hugos Versus 2015 Sad Puppies: Novelettes” at Women Write About Comics. Before I go on, I should—in the interests of balance—remind my readers that I generally liked the Puppy choices for Best Short Story; some had their flaws, but I felt that the only out-and-out dud was the Rabid slate’s “Turncoat.” Looking at the Puppy novelettes, on the other hand, I find myself decidedly unimpressed. (16) ROCK ENROLL. NASA’s new Planetary Defense Coordination Office will coordinate asteroid detection and hazard mitigation. NASA has formalized its ongoing program for detecting and tracking near-Earth objects (NEOs) as the Planetary Defense Coordination Office (PDCO). The office remains within NASA’s Planetary Science Division, in the agency’s Science Mission Directorate in Washington. The office will be responsible for supervision of all NASA-funded projects to find and characterize asteroids and comets that pass near Earth’s orbit around the sun. It will also take a leading role in coordinating interagency and intergovernmental efforts in response to any potential impact threats…. NASA’s long-term planetary defense goals include developing technology and techniques for deflecting or redirecting objects that are determined to be on an impact course with Earth. NASA’s Asteroid Redirect Mission concept would demonstrate the effectiveness of the gravity tractor method of planetary defense, using the mass of another object to pull an asteroid slightly from its original orbital path. The joint NASA-European Space Agency Asteroid Impact and Deflection Assessment (AIDA) mission concept, if pursued, would demonstrate an impact deflection method of planetary defense. Even if intervention is not possible, NASA would provide expert input to FEMA about impact timing, location and effects to inform emergency response operations. In turn, FEMA would handle the preparations and response planning related to the consequences of atmospheric entry or impact to U.S. communities. (17) AFRICAN SF. There are six African authors on BSFA Awards Longlist. Sarah Lotz has been nominated in the Best Novel category for Day Four, the follow-up on her bestseller The Three. Chinelo Onwualu of Nigeria has been nominated in the Best Non-fiction category for her essay “Race, Speculative Fiction And Afro SF”, published by the New Left Project. Unfortunately Samatar’s story won’t be eligible for the award as she announced hers is a reprint of a 2012 story. (18) ANIMAL FARM. The extended trailer for Disney live-action movie The Jungle Book looks pretty good. (19) WUV. Matthew Johnson contributed these instant classic parody lyrics in a comment.